Blue Knights are holding a “Blue Friday” sale with deep discounts on merchandise from the corps’ online store through November 30. Blue Stars invite aspiring composers to enter the organization’s “On Corps!” arranging competition. The winning arrangement or composition will be performed as part of the corps’ encore repertoire this summer. Save 25 percent on Bluecoats merchandise during the corps’ Black Friday sale through November 30. The Boston Crusaders are auctioning off a number of items, including flags and banners from the corps’ 2015 production, event tickets, and more. Read about what happened at the Cadets’ latest audition camp that took place November 20-22 in Pennington, New Jersey. Fifth-year Colts member Noah Perkins has been named the corps’ 2016 drum major. As part of #GivingTuesday, the Columbians have a matching gift on the table that will help pay for new brass instruments for the corps. Sean Cunningham has been named assistant corps director for Gold’s 2016 season. Jersey Surf wants you to keep their organization in mind on December 1, #GivingTuesday. 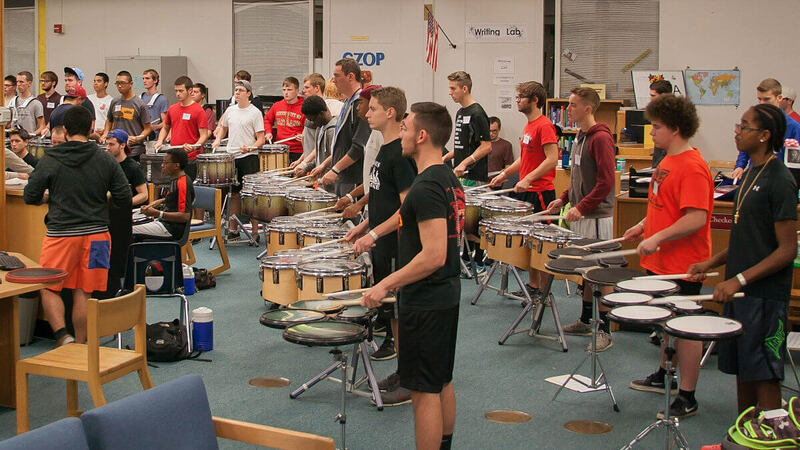 Legends reported its largest number of brass applicants at the corps’ recent audition camp. Check out these photos from the weekend. The contract of Madison Scouts executive director Chris Komnick has been extended through October of 2018. “Under (Komnick’s) leadership and the excellent staff he’s assembled, the Madison Scouts continue to positively impact thousands of students each year,” organization board president Gregg Auby said. Music City has a limited number of brass scholarships available to cover up to $2,000 of the corps’ $2,500 membership fee. Oregon Crusaders artistic director Adam Sage talks about the corps’ 2016 production in a recently-posted video to Facebook. #GivingTuesday on December 1, is a day you can set aside to give back to Pacific Crest. A 30 percent discount and free shipping is yours for the taking as part of Phantom Regiment’s Black Friday sale online. Troopers posted photos from the corps’ recent audition camp in Texas.